Bed bugs are found in all 50 states and can live in almost any crevice or protected location. The most common places to find them are in single-family homes, condos, apartments, hotels/motels and are traced to the areas where people sleep. These insects are particularly resilient, thrive almost anywhere and are difficult to eradicate. Our experienced and trained staff at Preferred Pest Control are dedicated to helping you get rid of this pest. We take a unique two-step approach to skillfully detect bed bugs and eliminate them with cutting edge solutions. Bed bug canine scent detection is the latest tool in detecting the odor of live bed bugs and viable eggs. Properly trained and certified scent detection canines are recognized in court as a “scientific instrument” and can detect the odor of bed bugs and viable eggs at a level as low as one live bed bug or viable egg. This incredible accuracy can reduce the treatment cost and the anguish of dealing with bed bugs and their bites by detecting them while the infestation is at a low level. Bed Bug Inspection: For quick and effective bed bug elimination, it is important to know where the bed bug activity is located. 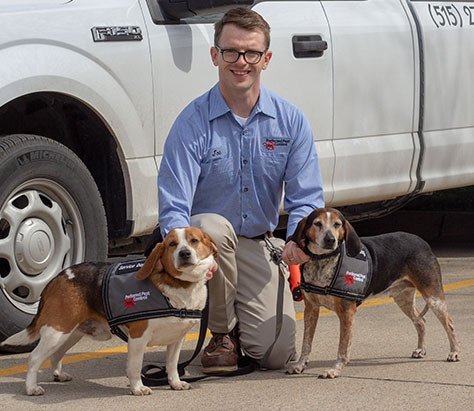 Preferred Pest's canine bed bug inspection will assist in developing a treatment that removes the guesswork by making sure that we are treating the infested areas and eliminating the need to treat unharmed areas. The result of our inspection will help to terminate or minimize the need to pay for treatment in rooms that are not affected. Proactive Services: Preferred Pest can customize a bed bug inspection schedule for your property on a one time basis, as needed or on a recurring schedule. We will proactively inspect your property and provide you with documentation which will show that our team has made every effort possible to ensure your property is free of bed bugs and is of the highest standards. This type of proactive action can not only give you peace of mind, but also may help to limit your liability in the case of a lawsuit. Preferred Pest Control's bed bug services use highly effective methods to accurately detect the odor of bed bugs wherever they may be hiding. Preferred Pest Control uses only WDDO certified bed bug detection canines. World Detector Dog Organization (WDDO) - The WDDO is a recognized authority on detection dog certification and training. This certification is performed annually and can give our customers confidence that they are receiving the most accurate service for detecting the odor of bed bugs. To earn this prestigious certification there are a couple different testing scenarios that are done as a double-blind test. This means when a dog and their handler are showcasing their bed bug detection skills, neither of them know where the bed bugs are located. Withholding this information from the trainer keeps the testing environment completely unbiased when they’re leading the canine through the area. Phase 1: A series of tubes are placed in front of the bed bug detection dog, and he must determine which tubes contain bed bugs based on the scent. Some of the other tubes will be empty or hold distractions, like food or other insects. The team must be 100% accurate to move on to the next test. Phase 2: The next inspection involves four separate rooms that have vials with bed bugs hidden within them. These bed bugs could be placed between mattresses, under furnace or tables, etc. The dog and handler will check the first two rooms, and if they pass they’ll move on to the last two rooms. They have to be completely accurate to pass the WDDO certification. Meet our canine team: Radar and Scout! Our Bed Bug Free treatment process is an effective solution to winning the battle with bed bugs. As a Bed Bug Free certified company, Preferred Pest has undergone rigorous screening and classroom training overseen by research Entomologist, Jeffery White. With this training Preferred Pest provides the most technologically-advanced techniques and tools to eliminate bed bugs from your home. Our 4 step process is designed to eradicate all life stages of bed bugs in a safe and effective manner. Applying Steam. A steam treatment is made to areas where bed bugs live such as mattresses, box springs, bed frames, night stands, baseboard trim, chairs, sofas and any other area that is a suspected area of bed bug activity. Our steamers produce temperatures over 200 degrees, which kills bed bugs and their eggs on contact. Using Mattress Encasements. Bed bug proof encasements are installed around mattresses and box springs in the affected areas. Our encasements help to eliminate bed bug hiding spots by creating a barrier between the mattress and the person sleeping on it. Our encasements will not allow bed bugs to enter, escape or bite through the encasement. Strategically Placing Interceptors. Climb Up Interceptors are specially designed plastic cups that are placed under each leg of the bed. The interceptors are pesticide free with polished walls that are too slick for the bugs to crawl out. Bugs approaching the bed from the floor will fall into the outer well while bed bugs leaving the bed will be captured in the center well. Finishing with Chemical Treatment. A limited amount of pesticide will be injected into cracks and crevices in and around the affected areas. Our treatment begins working within minutes of exposure and is non-staining. Our products kill all bed bug life stages by contact and also prevent bed bug eggs from hatching. Our bed bug treatment process uses extreme heat to kill the entire life cycle of bed bugs: adults, nymphs and eggs. Our experienced and state-certified extermination professionals are trained to eliminate bed bugs safely and effectively. In response to insecticide resistant bed bugs, Preferred Pest Control uses Thermal Remediation by Temp-Air, which is an effective solution designed specifically for the needs of homes, hotels, universities and property management companies. The Thermal Remediation target temperature during treatment is between 120-135°F, the temperature necessary for heat to penetrate bed bug harborages. This safe, effective, and environmentally-friendly process uses dry heat to kill the entire life cycle of bed bugs, reducing the application of insecticides. Applying Heat. Our exterminators place electric bed bug heaters within the space; introducing and recirculating heated air with a target temperature not to exceed 135°F for the controlled application of heat. Monitoring Temperature. Then our exterminators will monitor temperature in real time from a remote location using wireless sensors to ensure lethal temperatures are reached without damaging the space and its contents. Moving Air. High temperature fans move heated air throughout the space to reach insects in cracks and crevices or high infestation zones. A typical Thermal Remediation treatment will take about eight hours to complete. You will need to be gone during the treatment due to the high temperatures. At the completion of the bed bug extermination treatment, the room(s) will normally cool down within an hour. Therefore, most customers are able to sleep in their room the same night that the treatment has been completed. Preferred Pest has performed several thousand treatments using Thermal Remediation by Temp-Air over the last several years. We have the experience and expertise to provide the most advanced bed bug treatment available to eliminate this invasive pest. Pre-Inspection List to do before our trained canines visit your home. Preparation Checklist for homes receiving Thermal Heat Treatment. Frequently Asked Questions about Bed Bug Elimination Services with Thermal Remediation. Don't let bed bugs wreak havoc on your home or business. Take care of the problem quickly and efficiently with Preferred Pest, the leading bed bug removal service in the Des Moines metro. If you're ready to schedule an appointment for our bed bug services, keep in mind that before our Des Moines bed bug detection team arrives, you will need to review our pre-inspection checklists above. Upon arrival, our experienced pest technicians will review this checklist with you and have you sign a copy. Call (515) 276-7277 today if you have more questions or want to set up an inspection.